The Nike Zonal Cooling Women's Golf Polo combines stretchy, sweat-wicking fabric and targeted ventilation so you can stay cool throughout every round. Design details like a V-neck and blade collar freshen up this classic design. The Nike Zonal Cooling Women&apos;s Golf Polo combines stretchy, sweat-wicking fabric and targeted ventilation so you can stay cool throughout every round. Design details like a V-neck and blade collar freshen up this classic design. Nike Zonal Cooling technology enhances ventilation by placing an open-knit pattern in high-heat areas. Dropped back hem keeps you covered as you bend over the ball. 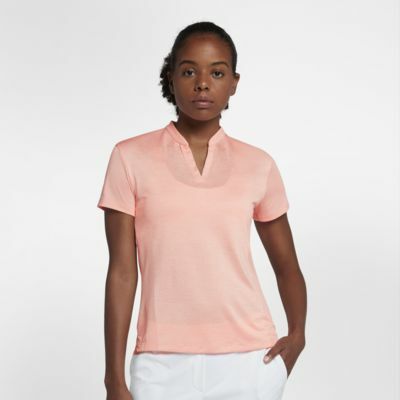 Blade collar and V-neck give this classic a feminine feel. Have your say. Be the first to review the Nike Zonal Cooling.